In my ongoing series on novel uses of the iPhone and iPad camera, here's yet another: an app that lets you take a picture of a leaf and then gives you information about what type of tree it as. 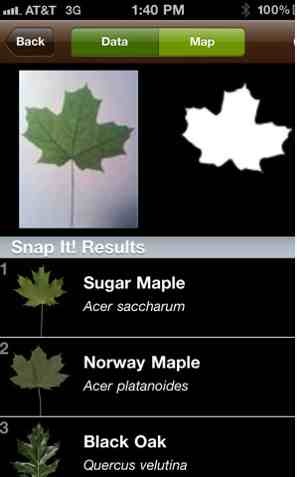 Leafsnap (free) returns the likely species name, as well high-resolution photographs of and information about the tree's leaves, flowers, fruit, seeds, and bark. The app was funded by a $2.5 million grant from the National Science Foundation and was developed by the Smithsonian Institution, University of Maryland, and Columbia University. It currently covers trees in the northeast and will eventually include the entire country. You can read more on Yahoo News.